A couple of personal issues came up; unfortunately causing me to delay this visit. Initially the appointment was scheduled for April 23, 2009 but was postponed until today. 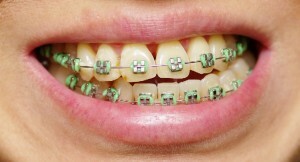 I asked for green elastic ligatures this time to celebrate the evincing of Spring… I have to have a little fun with this braces experience somehow. I’ve had less problems with pressure sores recently. It’s probably because there’s a little less movement of my teeth. I suppose they are more or less where they need to be; that is, give or take within millimeters. This entry was posted on Monday, August 3rd, 2009 at 3:30 pm	and is filed under Angela, braces. You can follow any responses to this entry through the RSS 2.0 feed. You can leave a response, or trackback from your own site.